Last week at SnB, a few people showed interest in my knitting bag, and Kris asked me to e-mail her the link to my source, so this is for you, Kris! 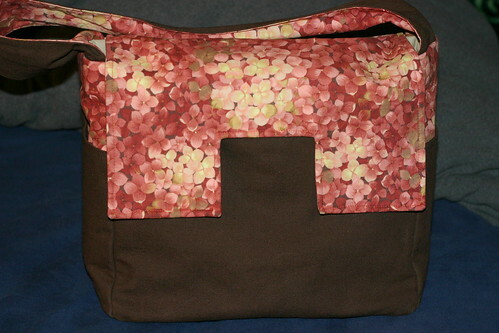 I bought the bag from Deb Donnelly Designs on Etsy.com, after browsing tons of different online stores. 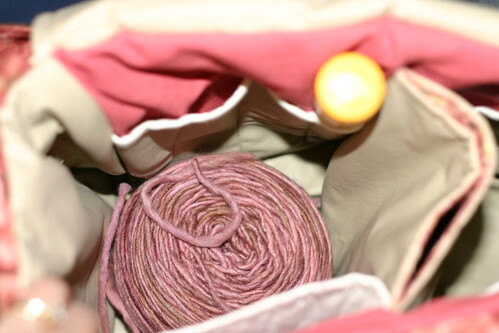 I liked the way she constructed her bags with multiple pockets and a center yarn opening, with two sets of magnetic closures so the opening can be bigger when I’m feeding yarn through it. But I wanted a bag in pink and brown (sound familiar?) specifically, which she didn’t have. 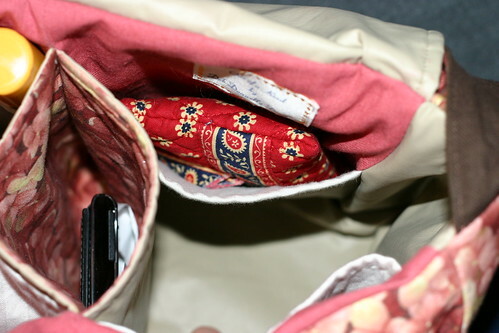 So I found a couple of fabrics I liked at an online fabric store, and she used them to make 3 different bags for me to choose from. This is the one I liked best, and she sold the remaining two to other customers. Her communication was great through the whole process, and she was really fast too! 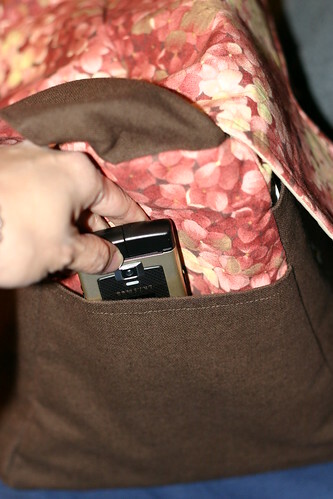 and there are four pockets lining the inside walls of the bag, one of which is divided into small vertical slots for needles. I don’t use straight needles, so I’m using one of the slots for my Epipen, and sometimes I stick the ends of my circular needles in there so they don’t go poking anywhere else. 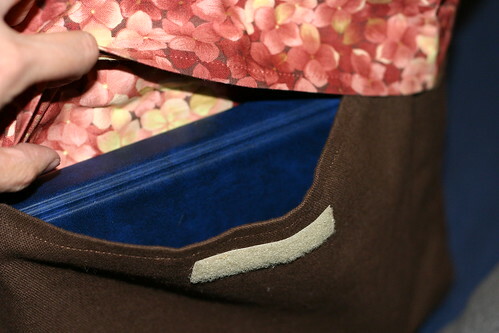 Between the two compartments are two dividers which create a slim pocket where I put my wallet type stuff. 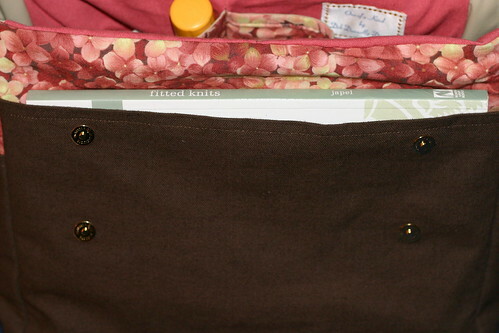 and the back has a velcro flap pocket big enough for my Denise needle case. 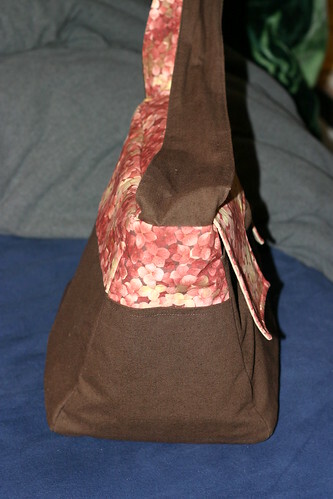 Each side of the bag has an outer pocket where I keep my cell phone and iPod for easy access, and sometimes a drink bottle. The insides are lined with vinyl, and overall the bag is pretty sturdy. I’ve used it for travel and for work, and it’s holding up great. I love it! I’m going to have to look at the fitted knits. I like the picture a lot! I think I have to finally just buy fitted knits. You sold me! Do you find it large enough to house all your travelling knitting? It’s been a long time, thanks for the review. I’ve just recieved a possible custom order from this. Thanks! I finally started a blog. I’m not too patient with new computer programs. Thank goodness for my husbands’ abilities. I am trying to purchase the knitting bag. How much, please and how-to ?